Squash House Quilts: Winners & Biggest Rainbow Ever! Teresa, who commented: "I Iove Halloween, which is my favorite holiday to decorate for, so decorating is my favorite part of Halloween!" Teresa will get Cyndy's "Behold" pattern and kit! On Thursday I took the first of two classes to make a table topper called Crazy Eight Strip Teaser! Turned out I was the only one of four who signed up for the class, so I got one-on-one instruction! Actually, all we did that day was cut and sew (and sew, and sew and sew) strips! Here are all my strips - 6 sets of 8 - lined up and ready for the next class! I'm so glad I took this picture as I realized the two light strips on top are reversed, so I will have to do a little un-sewing and re-sewing! I can't wait to finish this so I can have a gorgeous table topper for Fall! On Wednesday, Mr. Squash and I went over to the Tucannon River again. We left bright and early this time as it was another near triple-digit day. 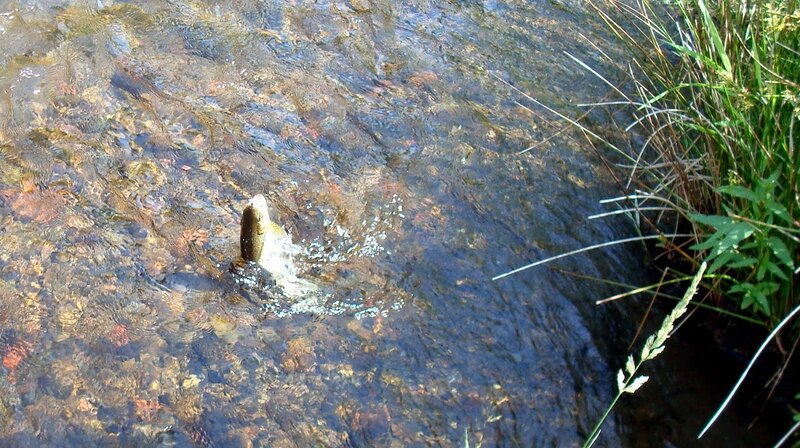 Here I am hooking a very small trout - you can see my lightweight rod is barely bending with the fish's weight. I was getting a little disappointed as that was all I was catching. Now it's been said that fishing should not be about what you catch, but about being out in nature, enjoying the day. Most often that's how I feel, but once in a while I admit it's nice to hook up with a beautiful trout. So off I went on my own down a little side stream, and on my first cast I hooked a whopper of a gorgeous, brightly colored Rainbow Trout - the biggest I had ever caught! I tried to get a picture of him with one hand while trying not to let him jump off the hook with the other, but he was really heavy and it wasn't easy. If you click on the photo, you might get an idea of how big he was - perhaps 1-2 pounds. 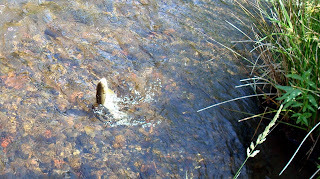 It was nice to meet him, then I let him go back to the stream to grow even bigger! When we got home, Sophie was feeling the effects of the warm day, so rather than sleep on her heated bed, she was sprawled out on the rocker - now that's a happy cat! Thank you Candace, and thank you Cyndy! I'm so excited to have won "Behold"!!! Love your fishing pics Candace. Up until last night I knew nothing about fly fishing, but coincidentally, I rented "A River Runs Through It" from Netflix, and my hubby and I watched it last night. It looks very relaxing and peaceful. Also, love your fabric choice for your class. Is that Adoring? I just bought a few fabrics from that line. Love it! Congrats to your winners and CONGRATS to YOU on that big fishy!! How fun is that?!!! I wanna be there with all the excitement of feeling a tug on the hook! Congratulations to the winners! Your fishing photos are great, the water is so clear even when it is so hot there. Congratulations to the lucky winners. Can't wait to see your table runner all done. Great colors. What a life Miss Sophie leads! Thank you so much for the wonderful prizes! I'm so excited to have won. Congrats on the fish! I would have had the hardest time throwing that one back, Candace. Fresh rainbow...my mouth is watering. Your table runner is going to be spectacular. L-O-V-E the colors! Sophie looks beyond relaxed! I want to be able to do that! Maybe this winter you can snap a pic of her on her heated bed? Looking forward to seeing your table runner. I love Gobble Gobble fabrics. Congrats on the catching of your biggest fish! I know how it feels, my biggest largemouth bass was 7 lbs. even and I hold the record, my hubby and I are quite competitive when it comes to our fishing. We just got back from the California Delta fishing for striped bass and even though most of them were small I still say I caught the biggest! Good job! Please post pix of your finished project. It sounds intriguing! Is that table runner gobble gobble? It's going to be so pretty.